This is the latest fashion poncho cape in this season. This sweater with refined workmanship is gorgeous and well made, it is out of the ordinary and catch persons' eyeballs firmly. Solid and simple design, will never out of fashion. The most unique design is reversible, both sides of this cardigan is wearable. This sweater is made of 50% Acrylic and 50% Polyester, feels soft and comfortable. Free size, large enough for most people. Size measurement: 150*130CM (59" * 51.2"). get fashion and warm at the same time. This stylish wrap is the perfect staple for your wardrobe. This knitted shawl is reversible, that is to say, you can wear it like two different cardigan. Very practical. 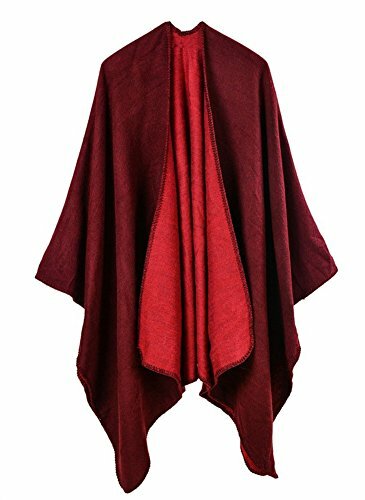 Super cozy oversized poncho shawl, a new fashion trending for this winter. Easy to wear and match with other clothes. Perfect for casual, school, office, dates, and parties any other occasions. Best option of gifts for family and friends. If you have any questions about this product by Hycurey, contact us by completing and submitting the form below. If you are looking for a specif part number, please include it with your message.